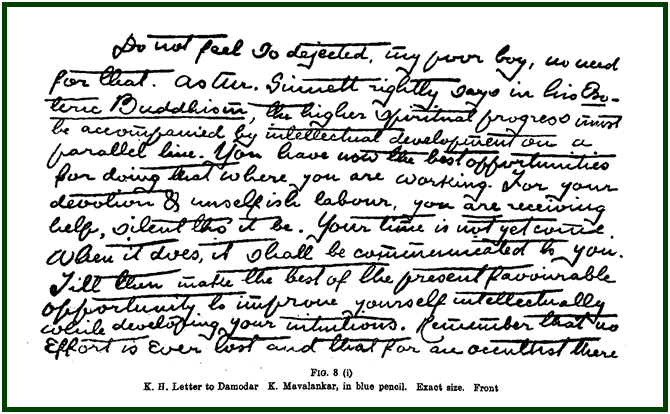 The general impression which remains in the minds of many of the public is that H. P. Blavatsky invented the Mahatmas, and that she buttressed this invention with various forms of impersonation and trickery, including among them the concocting of letters in various handwritings supposed to be written by the Adepts. When the now notorious report of the Society for Psychic Research was published in 1885, the public accepted the report as absolutely reliable, for much evidence seemed to be carefully presented. But even at the time those who were well informed knew that all the evidence had not been considered, for in many cases Mr. Richard Hodgson flatly refused to examine, as having the value of evidence, instance upon instance of facts which simply would not fit into his conception of H. P. Blavatsky as a trickster. Date of the present online edition of “Did Madame Blavatsky Forge the Mahatma Letters?”: March 2017. See also in our associated websites the article “The Heroic Nature of H. P. Blavatsky”, by C. Jinarajadasa.